THANKYOU to everyone who supported the Irish Sieger Breed Show 2018, judged by Herr Ulrich Hausmann and congratulations to the new Irish Sieger and Siegerin, Limoncello and Lexi. Big well done to all the youngsters who took part in the JUNIOR PUPPY WALK and helped raise funds for the Friends of the Cancer Centre at Belfast City Hospital. Thank you to the Davis family for their attendance and for donating a perpetual trophy in memory of Alvin Davis, late GSA Ireland Working Warden and OG Templepatrick Chair. Please read on for full results, more pictures to follow, by Gary Milliken and Elizabeth Campbell. MANY THANKS TO ALL CATALOGUE ADVERTISERS, EVENT SPONSORS, SUPPORTERS AND RAFFLE DONORS. Rosebud GSD, Von Armen GSD, Clonroot Kennels, Jubredo & Rosskeevan, Kashbeara GSD, Glensmodan GSD, Voneisen GSD, Evolution Pet Products, Alberdale GSD, Gareth Hutchinson, Go! 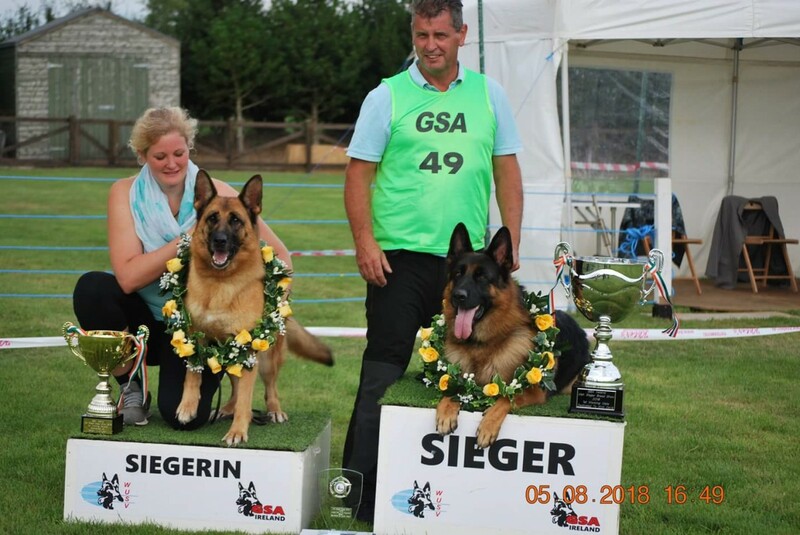 Dog, Kellie and Herbie McCaughan, Kennel Karlsruhe, Adrian Breslin, Moslindenlea GSD, Karanberg, von Krishoft GSD and all the GSA Ireland Ortsgruppe clubs. AQUA DOG, GARY MILLIKEN, JULIUS K9, GREYS OF BALLYCLARE, BARRY & ALLISON HILL, COLIN & LYNN BAILIE, MANDY NEILL, JUDITH KNOX, KELLIE McCAUGHAN, PAWLINES. Thanks to those who assisted with catering/logistics and to Gorana Leahy & Troy for performing the TSB practice run.